Nearly 34.1 million Americans are diagnosed with asthma by an allergist or other health professional during their lifetime, and approximately 70 percent of asthma patients also have allergies according to statistics compiled by the American Academy of Allergy, Asthma & Immunology. The National Center for Health Statistics reports 30.6 million American adults (nearly 14 percent) have been diagnosed with sinusitis. The sheer numbers of people who suffer from asthma, sinusitis and allergy symptoms or experience allergic reactions are daunting. But when you visit Allergy & Asthma Specialists of North Florida, we're concerned with just one person - You. Rest assured you will receive highly personalized care and can design a treatment plan that perfectly fits your unique lifestyle. We utilize a state of the art electronic medical records system and participate in electronic prescribing. At Allergy & Asthma Specialists of North Florida, we feel that this enables us to provide more extensive, secure and efficient care for our patients and allow us to travel to our multiple locations with ease without disruption in patient care. We also make patient visits quick and easy with downloadable new patient forms that you can complete and either submit electronically or print prior to your scheduled appointment. Allergy & Asthma Specialists of North Florida serve clients from four convenient locations in Orange Park, Mandarin, St. Johns Town Center-Southside, and the Westside. We accept most major insurance plans and same-or next-day appointments are available. If you live with asthma, allergies, allergic reactions or other related conditions, don't wait a minute longer to improve your health. Drs. DeMarco and Lupoli along with the rest of Allergy & Asthma Specialists of North Florida staff can help you breathe easy and enjoy life. Browse our website to learn more about our services. Then, contact us by phone or via our convenient online email form. 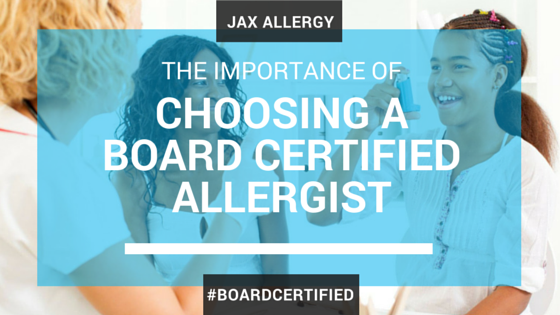 Why See a Board-Certified Allergist? Dr. DeMarco has cared for my children's asthma and allergy issues for almost five years. He has my daughter's asthma very well controlled while being as conservative as possible with medications…He has given excellent guidance on how to handle my children's food allergies. We feel very blessed to have a doctor that really cares about our family and has given such excellent medical advice. Thank you to the staff and doctors for treating my allergies. You are the best. The staff if always positive, helpful and professional. Their smiles are comforting. The doctors are positive and upbeat taking care to inform me of medical needs. I will recommend you to anyone needing your care.